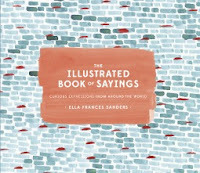 From the author of the New York Times bestseller, Lost in Translation, come this collection of 52 artistic renderings of sayings from around the world that illuminate the whimsical nature of language. Ella Frances Sanders's first book, Lost in Translation, captured the imagination of readers with its charmingly illustrated words that have no direct English translation. Now, the New York Times-bestselling author is back with an illustrated collection that addresses the nuances of language in the form of sayings from around the world. 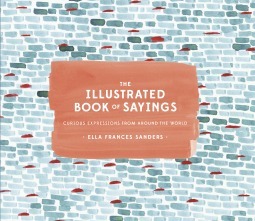 From the French idiom "to pedal in the sauerkraut," (i.e., "to spin your wheels,") to the Japanese idiom "even monkeys fall from trees" (meaning, "even experts can be wrong"), Sanders presents sayings that reveal the remarkable diversity, humor, and poignancy of the world's languages and cultures. To say that I love this book is an understatement. There is absolutely nothing that I dislike so I can't even do my usual the good, the bad, the summary. It's all good! I love the illustrations and how the author compares these incredible sayings from around the world with ones that I recognize from my own vocabulary. I've even used some of these in comments and posts around social media. In the time that I've had this book, I've found myself picking it up and reading it again and again. I don't think it's ever going to grow old. If you have a language lover in your life, this would be the most amazing gift. Seriously. It's one of my favorite things right now.